Area : 1786 sq. km. It is situated at a distance of 357 km from Kohima via Dimapur and 280 km from Dimapur, 275 km from Kohima via Mokokchung, Tamlu and Wakching. Here it is interesting to see the tattooed faces wearing feathered headgears and traditional dresses. Here one can find excellent woodcarvings, Machetes, guns and gunpowder, head brushes, headgears, neckles, etc. made by the adept artesian and skilled craftsmen. It is an exciting experience to pay a visit to Angh’s house at Chui, Mon Tangnyu, Sheangha, Chingnyu, Wakching and Jaboka. The most colourful festival of the Konyaks – Aoling Monyu that is observed during the first week of April every year is a spectacle worth a watch. 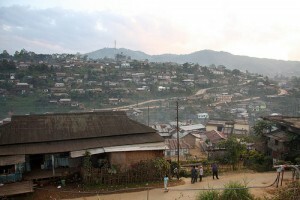 Shangnyu Village: Shangnyu Village is one of the prominent village in Mon district. There is a wonderful wooden monument measuring 8 ft. in height and 12 ft in breath – believed to be constructed by heavenly angle. Carvings of human beings and other creatures are engraved on this monument. Memorial stone are also found in front of the Angh’s Palace. Longwa Village: One of the biggest villages in Mon district is an interesting sight to see. As the village straddles on the international boundary line, one half of the Angh’s house fall within the Indian Territory, where as, the other half lies under Myanmarise control. Another interesting features of this village is that the Angh of the village has 60 wives and his jurisdiction extend upto Mynmar and Arunachal Pradesh. Naganimora: Naganimora is a sub-division in Mon district and is sited in Kongan village land. Nagani meaning Naga Queen and Mora meaning Death – the death place of Naga Queen. The second rail link to Nagaland from Simulguri (Assam) also connects Naganimora. Every Saturday, there is an interesting weekly market here with a medley crowd of Assamese and Konyak Nagas. Veda Peak: Veda Peak, the highest peak in Mon district is 70 km east of Mon district. From this peak, one can have a clear view of both river Brahmaputra and Chindwing on a clear day. There is a waterfall on precinpts of this peak and this area is also considered as one of the best location in the whole of Konyak countryside. This entry was posted in Mon, Nagaland and tagged Longwa Village, Naganimora, Shangnyu Village, Veda Peak. Bookmark the permalink.